As a parent, it’s not always easy to know when your child is ready for orthodontic treatment. Each child is unique, and there is a wide range of normal tooth development in young children. 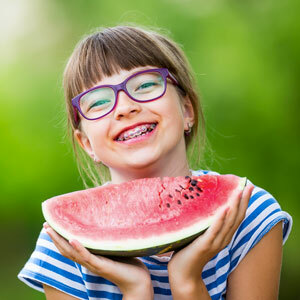 In order to evaluate how the teeth and jaws are developing, Lake St. Louis orthodontist Dr. Seim and the American Association of Orthodontists recommend that children have their first orthodontic appointment at age 7. At this age, the teeth and jaws are still developing and the jaw is still growing, making certain orthodontic problems, such as a crossbite or crowding, easier to address. Getting started with early orthodontic treatment can help prepare for a smoother transition to any future treatment options like braces. However, not every child needs early treatment. It is important to be evaluated by an orthodontist to determine when the proper treatment time is for your child. At Seim Orthodontics, we can provide a free consult and we will help you make an informed decision about what is best for your child. At the first visit, Dr. Seim will evaluate your child’s teeth and facial pattern to look for any irregularities in the bite and jaw. She’ll also assess whether the teeth are coming in as they should and whether they have the space to do so. If your child is ready for orthodontics, we will begin a first phase of treatment. Dr. Seim will explain more about each treatment during your visit so that you can fully understand the benefits. If treatment is not yet indicated, Dr. Seim will monitor your child’s growth and development at 6 to 12 month intervals. If your child is 7 or older and hasn’t been to an orthodontist for a check, contact our practice to get started. If treatment is not necessary, Dr. Seim will give you her honest opinion. We take everything into consideration and help you make a decision about what is best for your child.